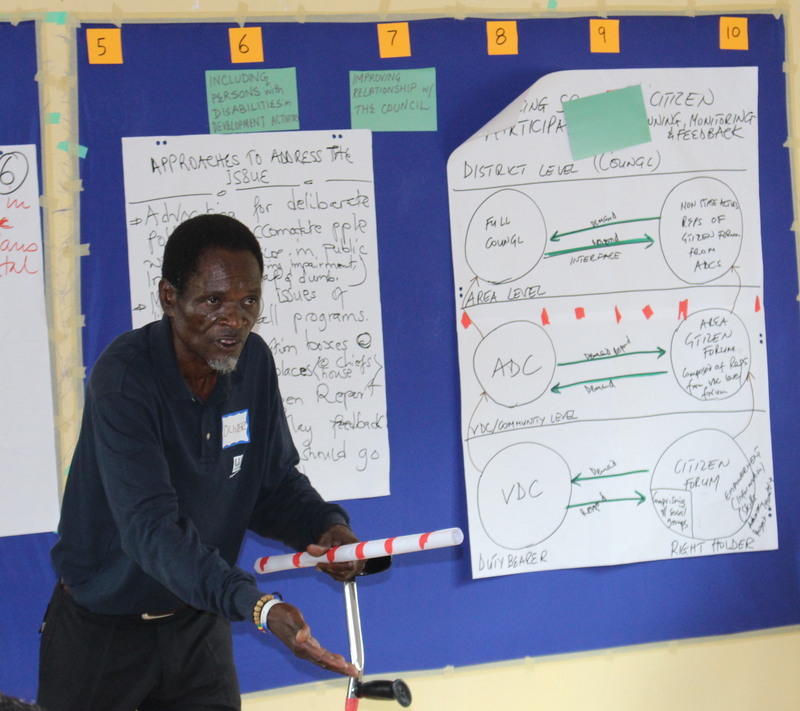 In yesterday’s blog we asked a bold question, ‘Can social labs save development?’ Day two brought us deep into social lab process. The morning began with reflections on the insights of yesterday. Participants spoke with emotion about seeing the broken relationships systematically mapped from the perspective of each constituent group. And how important it is to surface the issues and find ways of fixing the relationships. Not surprising was the fact that the levels of trust between community-based groups and government structures was low. What did surprise, was the relatively low levels of trust felt by both community-based groups and government structures towards local NGOs! Levels of trust with faith-based organizations and traditional leadership scored highly. 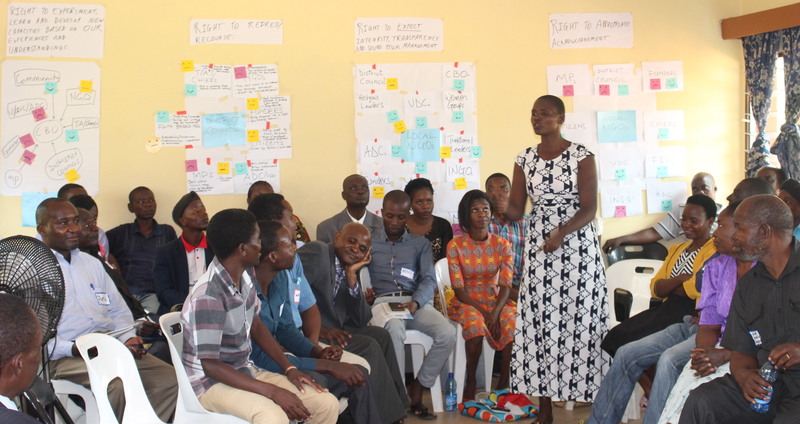 Then we went into the first of a series of ‘open spaces’ in which individuals proposed ideas and issues that had emerged for them, and that they wanted to explore. Following the open space method, topic proposers pitched their topics and participants chose which topics to join to explore further. There will be more open space opportunities throughout the social lab process. Issue groups included how to make aid more sustainable and supportive of economic and social independence; better, more accountable ways of ‘managing’ government and non-governmental development resources; better spaces for citizen participation in development decision-making that affects them; how to heal relationship breakdowns; and how community initiatives could be resourced more directly. Voice was a common thread through most of these. In many cases it took time to get agreement. 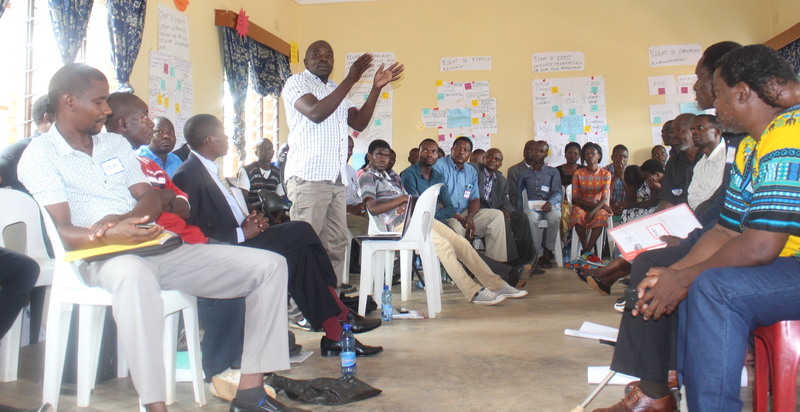 The issue groups and the plenaries included people from NGOs, CBOs, local government, funders, and chiefs. The discussions were robust, but good humored. We experienced how sometimes very the different perspectives could be accommodated within a sense of agreement. Sometimes, disagreements were acknowledged openly and held as the possible grounds for a separate idea to be further developed. The first set of ideas was loudly discussed and critiqued in plenary, and then a second round of ideas was called for. This time participants were asked to pitch their ideas as ‘What if we tried to…’. The day ended with nine ideas to be developed further tomorrow as possible new solutions that people in Rumphi can try themselves. Tomorrow will be a day of digging into these ideas rigorously with a view to choosing three to five ideas to take forward to the last day to develop testable prototypes. This entry was posted in Client Work, Discussion and tagged Malawi, root change, social lab, USAID. Bookmark the permalink. ← Can social labs save development?